Den senaste presidenten som har avlidit är George H.W. Bush (1989–93) som dog den 30 november 2018, 94 år gammal. ^ [a b c d e f g h i j k] Dog i tjänst av naturliga orsaker. ^ Egentligen demokrat, men värvades av Whigpartiet för att stå som Harrisons vicepresidentkandidat på deras valsedel. ^ [a b c d] Mördad. ^ Egentligen demokrat, men värvades av Republikanska partiet (USA) för att stå som vicepresidentkandidat på deras valsedel för nationell samling (National Union) 1864 och var därefter partilös. ^ The White House (12 mars 2007 (2007-03-12)). ”Biography of George Washington”. Whitehouse.gov. Arkiverad från originalet den 22 januari 2009. https://web.archive.org/web/20090122233926/http://www.whitehouse.gov/about/presidents/georgewashington/. Läst 12 januari 2009 (2009-01-12). ^ ”George Washington – no Political Party – 1st President – American Presidents”. History. Arkiverad från originalet den 26 februari 2009. https://web.archive.org/web/20090226045727/http://www.history.com/presidents/washington. Läst 12 januari 2009 (2009-01-12). ^ ”George Washington (February 22, 1732 – December 14, 1799)”. American Presidents: Life Portraits. C-SPAN. http://americanpresidents.org/presidents/gwashington.asp. Läst 12 januari 2009 (2009-01-12). ^ ”Biography of John Adams”. Whitehouse.gov. 12 mars 2007. Arkiverad från originalet den 22 januari 2009. https://web.archive.org/web/20090122233613/http://www.whitehouse.gov/about/presidents/johnadams/. Läst 12 januari 2009. ^ ”John Adams – Federalist Party – 2nd President – American Presidents”. History. Arkiverad från originalet den 25 februari 2009. https://web.archive.org/web/20090225173126/http://www.history.com/presidents/adams. Läst 12 januari 2009. ^ ”John Adams (October 30, 1735 – July 4, 1826)”. American Presidents: Life Portrait. C-SPAN. http://americanpresidents.org/presidents/president.asp?PresidentNumber=2. Läst 12 januari 2009. ^ ”Biography of Thomas Jefferson”. Whitehouse.gov. 12 mars 2007. Arkiverad från originalet den 22 januari 2009. https://web.archive.org/web/20090122233849/http://www.whitehouse.gov/about/presidents/thomasjefferson/. Läst 12 januari 2009. ^ ”Thomas Jefferson – Democratic-Republican Party – 3rd President – American Presidents”. History. Arkiverad från originalet den 5 mars 2009. https://web.archive.org/web/20090305021547/http://www.history.com/presidents/jefferson. Läst 12 januari 2009. ^ ”Thomas Jefferson (April 13, 1743 – July 4, 1826)”. American Presidents: Life Portrait. C-SPAN. http://americanpresidents.org/presidents/president.asp?PresidentNumber=3. Läst 12 januari 2009. ^ ”Biography of James Madison”. Whitehouse.gov. 12 mars 2007. Arkiverad från originalet den 22 januari 2009. https://web.archive.org/web/20090122233519/http://www.whitehouse.gov/about/presidents/jamesmadison/. Läst 12 januari 2009. ^ ”James Madison – Democratic-Republican Party – 4th President – American Presidents”. History. Arkiverad från originalet den 26 februari 2009. https://web.archive.org/web/20090226045635/http://www.history.com/presidents/madison. Läst 12 januari 2009. ^ ”James Madison (March 16, 1751 – June 28, 1836)”. American Presidents: Life Portrait. C-SPAN. http://americanpresidents.org/presidents/president.asp?PresidentNumber=4. Läst 12 januari 2009. ^ ”Biography of James Madison”. Whitehouse.gov. 12 mars 2007. Arkiverad från originalet den 22 januari 2009. https://web.archive.org/web/20090122233643/http://www.whitehouse.gov/about/presidents/jamesmonroe/. Läst 12 januari 2009. ^ ”James Monroe – Democratic-Republican Party – 5th President – American Presidents”. History. Arkiverad från originalet den 5 mars 2009. https://web.archive.org/web/20090305021721/http://www.history.com/presidents/monroe. Läst 12 januari 2009. ^ ”James Monroe (April 28, 1758 – July 4, 1831)”. American Presidents: Life Portrait. C-SPAN. http://americanpresidents.org/presidents/president.asp?PresidentNumber=5. Läst 12 januari 2009. ^ ”Biography of John Quincy Adams”. Whitehouse.gov. 12 mars 2007. Arkiverad från originalet den 22 januari 2009. https://web.archive.org/web/20090122233538/http://www.whitehouse.gov/about/presidents/johnquincyadams/. Läst 12 januari 2009. ^ ”John Quincy Adams – Federalist, Democratic-Republican, National Republican, WHIG Party – 6th President – American Presidents”. History. Arkiverad från originalet den 5 mars 2009. https://web.archive.org/web/20090305021449/http://www.history.com/presidents/johnqadams. Läst 12 januari 2009. ^ ”John Quincy Adams (July 11, 1767 – February 23, 1848)”. American Presidents: Life Portrait. C-SPAN. http://americanpresidents.org/presidents/president.asp?PresidentNumber=6. Läst 12 januari 2009. ^ ”Biography of Andrew Jackson”. Whitehouse.gov. 12 mars 2007. Arkiverad från originalet den 22 januari 2009. https://web.archive.org/web/20090122233706/http://www.whitehouse.gov/about/presidents/andrewjackson/. Läst 12 januari 2009. ^ ”Andrew Jackson – Democratic-Republican Party – 7th President – American Presidents”. History. Arkiverad från originalet den 24 februari 2009. https://web.archive.org/web/20090224231126/http://www.history.com/presidents/jackson. Läst 12 januari 2009. ^ ”Andrew Jackson (March 15, 1767 – June 8, 1845)”. American Presidents: Life Portrait. C-SPAN. http://americanpresidents.org/presidents/president.asp?PresidentNumber=7. Läst 12 januari 2009. ^ ”Biography of Martin Van Buren”. Whitehouse.gov. 12 mars 2007. Arkiverad från originalet den 22 januari 2009. https://web.archive.org/web/20090122233744/http://www.whitehouse.gov/about/presidents/martinvanburen/. Läst 12 januari 2009. ^ ”Martin Van Buren – Democratic-Republican, Democratic, and Free Soil Party – 8th President – American Presidents”. History. Arkiverad från originalet den 5 mars 2009. https://web.archive.org/web/20090305021457/http://www.history.com/presidents/vanburen. Läst 12 januari 2009. ^ ”Martin Van Buren (December 5, 1782 – July 24, 1862)”. American Presidents: Life Portrait. C-SPAN. http://americanpresidents.org/presidents/president.asp?PresidentNumber=8. Läst 12 januari 2009. ^ ”Biography of William Henry Harrison”. Whitehouse.gov. 12 mars 2007. Arkiverad från originalet den 22 januari 2009. https://web.archive.org/web/20090122233458/http://www.whitehouse.gov/about/presidents/williamhenryharrison/. Läst 12 januari 2009. ^ ”William Henry Harrison – WHIG Party – 9th President – American Presidents”. History. Arkiverad från originalet den 5 mars 2009. https://web.archive.org/web/20090305021541/http://www.history.com/presidents/williamhenryharrison. Läst 12 januari 2009. ^ ”William Henry Harrison (February 9, 1773 – April 4, 1841)”. American Presidents: Life Portrait. C-SPAN. http://americanpresidents.org/presidents/president.asp?PresidentNumber=9. Läst 12 januari 2009. ^ ”Biography of John Tyler”. Whitehouse.gov. 12 mars 2007. Arkiverad från originalet den 22 januari 2009. https://web.archive.org/web/20090122233544/http://www.whitehouse.gov/about/presidents/johntyler/. Läst 12 januari 2009. ^ ”John Tyler – No Party – 10th President – American Presidents”. History. Arkiverad från originalet den 5 mars 2009. https://web.archive.org/web/20090305021653/http://www.history.com/presidents/tyler. Läst 12 januari 2009. ^ ”John Tyler (March 29, 1790 – January 18, 1862)”. American Presidents: Life Portrait. C-SPAN. http://americanpresidents.org/presidents/president.asp?PresidentNumber=10. Läst 12 januari 2009. ^ ”Biography of James Polk”. Whitehouse.gov. 12 mars 2007. Arkiverad från originalet den 22 januari 2009. https://web.archive.org/web/20090122224735/http://www.whitehouse.gov/about/presidents/jamespolk/. Läst 12 januari 2009. ^ ”James Polk – Democratic Party – 11th President – American Presidents”. History. Arkiverad från originalet den 5 mars 2009. https://web.archive.org/web/20090305021553/http://www.history.com/presidents/polk. Läst 12 januari 2009. ^ ”James K. Polk (November 2, 1795 – June 15, 1849)”. American Presidents: Life Portrait. C-SPAN. http://americanpresidents.org/presidents/president.asp?PresidentNumber=11. Läst 12 januari 2009. ^ ”Biography of Zachary Taylor”. Whitehouse.gov. 12 mars 2007. Arkiverad från originalet den 1 oktober 2013. https://web.archive.org/web/20131001011504/http://www.whitehouse.gov/about/presidents/zacharytaylor. Läst 12 januari 2009. ^ ”Zachary Taylor – WHIG Party – 12th President – American Presidents”. History. Arkiverad från originalet den 5 mars 2009. https://web.archive.org/web/20090305021625/http://www.history.com/presidents/taylor. Läst 12 januari 2009. ^ ”Zachary Taylor (November 24, 1784 – July 9, 1850)”. American Presidents: Life Portrait. C-SPAN. http://americanpresidents.org/presidents/president.asp?PresidentNumber=12. Läst 12 januari 2009. ^ ”Biography of Millard Fillmore”. Whitehouse.gov. 12 mars 2007. Arkiverad från originalet den 22 januari 2009. https://web.archive.org/web/20090122005520/http://www.whitehouse.gov/about/presidents/millardfillmore/. Läst 12 januari 2009. ^ ”Millard Filmore – WHIG Party – 13th President – American Presidents”. History. Arkiverad från originalet den 5 mars 2009. https://web.archive.org/web/20090305021519/http://www.history.com/presidents/fillmore. Läst 12 januari 2009. ^ ”Millard Fillmore (January 7, 1800 – March 8, 1874)”. American Presidents: Life Portrait. C-SPAN. http://americanpresidents.org/presidents/president.asp?PresidentNumber=13. Läst 12 januari 2009. ^ ”Biography of Franklin Pierce”. Whitehouse.gov. 12 mars 2007. Arkiverad från originalet den 22 januari 2009. https://web.archive.org/web/20090122233712/http://www.whitehouse.gov/about/presidents/franklinpierce/. Läst 12 januari 2009. ^ ”Franklin Pierce – Democratic Party – 14th President – American Presidents”. History. Arkiverad från originalet den 5 mars 2009. https://web.archive.org/web/20090305021425/http://www.history.com/presidents/pierce. Läst 12 januari 2009. ^ ”Franklin Pierce (November 23, 1804 – October 8, 1869)”. American Presidents: Life Portrait. C-SPAN. http://americanpresidents.org/presidents/president.asp?PresidentNumber=14. Läst 12 januari 2009. ^ ”Biography of James Buchanan”. Whitehouse.gov. 12 mars 2007. Arkiverad från originalet den 22 januari 2009. https://web.archive.org/web/20090122233655/http://www.whitehouse.gov/about/presidents/jamesbuchanan/. Läst 12 januari 2009. ^ ”James Buchanan – Democratic Party – 15th President – American Presidents”. History. Arkiverad från originalet den 5 mars 2009. https://web.archive.org/web/20090305021706/http://www.history.com/presidents/buchanan. Läst 12 januari 2009. ^ ”James Buchanan (April 23, 1791 – June 1, 1868)”. American Presidents: Life Portrait. C-SPAN. http://americanpresidents.org/presidents/president.asp?PresidentNumber=15. Läst 12 januari 2009. ^ ”Biography of Abraham Lincoln”. Whitehouse.gov. 12 mars 2007. Arkiverad från originalet den 22 januari 2009. https://web.archive.org/web/20090122233609/http://www.whitehouse.gov/about/presidents/abrahamlincoln/. Läst 12 januari 2009. ^ ”Abraham Lincoln – Republic, National Union Party – 16th President – American Presidents”. History. Arkiverad från originalet den 24 februari 2009. https://web.archive.org/web/20090224235612/http://www.history.com/presidents/lincoln. Läst 12 januari 2009. ^ ”Abraham Lincoln (February 12, 1809 – April 15, 1865)”. American Presidents: Life Portrait. C-SPAN. http://americanpresidents.org/presidents/president.asp?PresidentNumber=16. Läst 12 januari 2009. ^ ”Biography of Andrew Johnson”. Whitehouse.gov. 12 mars 2007. Arkiverad från originalet den 22 januari 2009. https://web.archive.org/web/20090122233702/http://www.whitehouse.gov/about/presidents/andrewjohnson/. Läst 12 januari 2009. ^ ”Andrew Johnson – National Union Party – 17th President – American Presidents”. History. Arkiverad från originalet den 5 mars 2009. https://web.archive.org/web/20090305021512/http://www.history.com/presidents/andrewjohnson. Läst 12 januari 2009. ^ ”Andrew Johnson (December 29, 1808 – July 31, 1875)”. American Presidents: Life Portrait. C-SPAN. http://americanpresidents.org/presidents/president.asp?PresidentNumber=17. Läst 12 januari 2009. ^ ”Biography of Ulysses S. Grant”. Whitehouse.gov. 12 mars 2007. Arkiverad från originalet den 22 januari 2009. https://web.archive.org/web/20090122233733/http://www.whitehouse.gov/about/presidents/ulyssessgrant/. Läst 12 januari 2009. ^ ”Ulysses S. Grant – National Union Party – 18th President – American Presidents”. History. Arkiverad från originalet den 5 mars 2009. https://web.archive.org/web/20090305021639/http://www.history.com/presidents/grant. Läst 12 januari 2009. ^ ”Ulysses S. Grant (April 27, 1822 – July 23, 1885)”. American Presidents: Life Portrait. C-SPAN. http://americanpresidents.org/presidents/president.asp?PresidentNumber=18. Läst 12 januari 2009. ^ ”Biography of Rutherford B. Hayes”. Whitehouse.gov. 12 mars 2007. Arkiverad från originalet den 22 januari 2009. https://web.archive.org/web/20090122233906/http://www.whitehouse.gov/about/presidents/rutherfordbhayes/. Läst 12 januari 2009. ^ ”Rutherford B. Hayes – Republican Party – 19th President – American Presidents”. History. Arkiverad från originalet den 5 mars 2009. https://web.archive.org/web/20090305021700/http://www.history.com/presidents/hayes. Läst 12 januari 2009. ^ ”Rutherford B. Hayes (October 4, 1822 – January 17, 1893)”. American Presidents: Life Portrait. C-SPAN. http://americanpresidents.org/presidents/president.asp?PresidentNumber=19. Läst 12 januari 2009. ^ ”Biography of James Garfield”. Whitehouse.gov. 12 mars 2007. Arkiverad från originalet den 22 januari 2009. https://web.archive.org/web/20090122233941/http://www.whitehouse.gov/about/presidents/jamesgarfield/. Läst 12 januari 2009. ^ ”James Garfield – Republican Party – 20th President – American Presidents”. History. Arkiverad från originalet den 5 mars 2009. https://web.archive.org/web/20090305021632/http://www.history.com/presidents/garfield. Läst 12 januari 2009. ^ ”James A. Garfield (November 19, 1831 – September 19, 1881)”. American Presidents: Life Portrait. C-SPAN. http://americanpresidents.org/presidents/president.asp?PresidentNumber=20. Läst 12 januari 2009. ^ ”Biography of Chester Arthur”. Whitehouse.gov. 12 mars 2007. Arkiverad från originalet den 22 januari 2009. https://web.archive.org/web/20090122233930/http://www.whitehouse.gov/about/presidents/chesterarthur/. Läst 12 januari 2009. 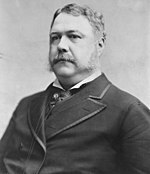 ^ ”Chester A. Arthur – Republican Party – 21st President – American Presidents”. History. Arkiverad från originalet den 5 mars 2009. https://web.archive.org/web/20090305021713/http://www.history.com/presidents/arthur. Läst 12 januari 2009. ^ ”Chester A. Arthur (October 5, 1829 – November 18, 1886)”. American Presidents: Life Portrait. C-SPAN. http://americanpresidents.org/presidents/president.asp?PresidentNumber=21. Läst 12 januari 2009. ^ [a b] ”Grover Cleveland – Democratic Party – 22nd and 24th President – American Presidents”. History. Arkiverad från originalet den 5 mars 2009. https://web.archive.org/web/20090305021617/http://www.history.com/presidents/cleveland. Läst 12 januari 2009. ^ [a b] ”Grover Cleveland (March 18, 1837 – June 24, 1908)”. American Presidents: Life Portrait. C-SPAN. http://americanpresidents.org/presidents/president.asp?PresidentNumber=22. Läst 12 januari 2009. ^ ”Biography of Benjamin Harrison”. Whitehouse.gov. 12 mars 2007. Arkiverad från originalet den 22 januari 2009. https://web.archive.org/web/20090122233755/http://www.whitehouse.gov/about/presidents/benjaminharrison/. Läst 12 januari 2009. ^ ”William Henry Harrison – Whig Party – 23rd President – American Presidents”. History. Arkiverad från originalet den 25 februari 2009. https://web.archive.org/web/20090225173803/http://www.history.com/presidents/benjaminharrison. Läst 12 januari 2009. ^ ”Benjamin Harrison (August 20, 1833 – March 13, 1901)”. American Presidents: Life Portrait. C-SPAN. http://americanpresidents.org/presidents/president.asp?PresidentNumber=23. Läst 12 januari 2009. ^ ”Biography of William McKinley”. Whitehouse.gov. 12 mars 2007. Arkiverad från originalet den 22 januari 2009. https://web.archive.org/web/20090122233617/http://www.whitehouse.gov/about/presidents/williammckinley/. Läst 12 januari 2009. ^ ”William McKinley – Republican Party – 25th President – American Presidents”. History. Arkiverad från originalet den 5 mars 2009. https://web.archive.org/web/20090305021610/http://www.history.com/presidents/mckinley. Läst 12 januari 2009. ^ ”William McKinley (January 29, 1843 – September 14, 1901)”. American Presidents: Life Portrait. C-SPAN. http://americanpresidents.org/presidents/president.asp?PresidentNumber=24. Läst 12 januari 2009. ^ ”Biography of Theodore Roosevelt”. Whitehouse.gov. 12 mars 2007. Arkiverad från originalet den 22 januari 2009. https://web.archive.org/web/20090122233759/http://www.whitehouse.gov/about/presidents/theodoreroosevelt/. Läst 12 januari 2009. ^ ”Theodore Roosevelt – Republican, Bull Moose Party – 26th President – American Presidents”. History. Arkiverad från originalet den 26 februari 2009. https://web.archive.org/web/20090226034721/http://www.history.com/presidents/teddyroosevelt. Läst 12 januari 2009. ^ ”Theodore Roosevelt (October 27, 1858 – January 6, 1919)”. American Presidents: Life Portrait. C-SPAN. http://americanpresidents.org/presidents/president.asp?PresidentNumber=25. Läst 12 januari 2009. ^ ”Biography of William Howard Taft”. Whitehouse.gov. 13 mars 2007. Arkiverad från originalet den 22 januari 2009. https://web.archive.org/web/20090122233911/http://www.whitehouse.gov/about/presidents/williamhowardtaft/. Läst 12 januari 2009. ^ ”William Howard Taft – Republican Party – 27th President – American Presidents”. History. Arkiverad från originalet den 5 mars 2009. https://web.archive.org/web/20090305021434/http://www.history.com/presidents/taft. Läst 12 januari 2009. ^ ”William Howard Taft (September 15, 1857 – March 8, 1930)”. American Presidents: Life Portrait. C-SPAN. http://americanpresidents.org/presidents/president.asp?PresidentNumber=26. Läst 12 januari 2009. ^ ”Biography of Woodrow Wilson”. Whitehouse.gov. 13 mars 2007. Arkiverad från originalet den 22 januari 2009. https://web.archive.org/web/20090122233839/http://www.whitehouse.gov/about/presidents/woodrowwilson/. Läst 12 januari 2009. ^ ”Woodrow Wilson – Democratic Party – 28th President – American Presidents”. History. Arkiverad från originalet den 5 mars 2009. https://web.archive.org/web/20090305021442/http://www.history.com/presidents/wilson. Läst 12 januari 2009. ^ ”Woodrow Wilson (December 28, 1856 – February 3, 1924)”. American Presidents: Life Portrait. C-SPAN. http://americanpresidents.org/presidents/president.asp?PresidentNumber=27. Läst 12 januari 2009. ^ ”Biography of Warren G. Harding”. Whitehouse.gov. 12 mars 2007. Arkiverad från originalet den 22 januari 2009. https://web.archive.org/web/20090122233453/http://www.whitehouse.gov/about/presidents/warrenharding/. Läst 12 januari 2009. ^ ”Warren Harding – Republican Party – 29th President – American Presidents”. History. Arkiverad från originalet den 5 mars 2009. https://web.archive.org/web/20090305021442/http://www.history.com/presidents/wilson. Läst 12 januari 2009. ^ ”Warren G. Harding (November 2, 1865 – August 2, 1923)”. American Presidents: Life Portrait. C-SPAN. http://americanpresidents.org/presidents/president.asp?PresidentNumber=28. Läst 12 januari 2009. ^ ”Biography of Calvin Coolidge”. Whitehouse.gov. 13 mars 2007. Arkiverad från originalet den 22 januari 2009. https://web.archive.org/web/20090122233449/http://www.whitehouse.gov/about/presidents/calvincoolidge/. Läst 12 januari 2009. ^ ”Calvin Coolidge – Republican Party – 30th President – American Presidents”. History. Arkiverad från originalet den 5 mars 2009. https://web.archive.org/web/20090305021442/http://www.history.com/presidents/wilson. Läst 12 januari 2009. ^ ”Calvin Coolidge (July 4, 1872 – January 5, 1933)”. American Presidents: Life Portrait. C-SPAN. http://americanpresidents.org/presidents/president.asp?PresidentNumber=29. Läst 12 januari 2009. ^ ”Biography of Herbert Hoover”. Whitehouse.gov. 13 mars 2007. Arkiverad från originalet den 15 september 2011. https://www.webcitation.org/61i8WyDja?url=http://www.whitehouse.gov/about/presidents/herberthoover/. Läst 12 januari 2009. ^ ”Herbert Hoover – Republican Party – 31st President – American Presidents”. History. Arkiverad från originalet den 5 mars 2009. https://web.archive.org/web/20090305021442/http://www.history.com/presidents/wilson. Läst 12 januari 2009. ^ ”Herbert Hoover (August 10, 1874 – October 20, 1964)”. American Presidents: Life Portrait. C-SPAN. http://americanpresidents.org/presidents/president.asp?PresidentNumber=30. Läst 12 januari 2009. ^ ”Biography of Franklin D. Roosevelt”. Whitehouse.gov. 20 mars 2007. Arkiverad från originalet den 18 oktober 2013. https://web.archive.org/web/20131018145555/http://www.whitehouse.gov/about/presidents/franklindroosevelt. Läst 12 januari 2009. ^ ”Franklin D. Roosevelt – Democratic Party – 32nd President – American Presidents”. History. Arkiverad från originalet den 25 februari 2009. https://web.archive.org/web/20090225043039/http://www.history.com/presidents/fdr. Läst 12 januari 2009. ^ ”Franklin D. Roosevelt (January 30, 1882 – April 12, 1945)”. American Presidents: Life Portrait. C-SPAN. http://americanpresidents.org/presidents/president.asp?PresidentNumber=31. Läst 12 januari 2009. ^ ”Biography of Harry S Truman”. Whitehouse.gov. 12 mars 2007. Arkiverad från originalet den 22 januari 2009. https://web.archive.org/web/20090122233649/http://www.whitehouse.gov/about/presidents/harrystruman/. Läst 12 januari 2009. ^ ”Harry S Truman – Democratic Party – 33rd President – American Presidents”. History. Arkiverad från originalet den 25 februari 2009. https://web.archive.org/web/20090225043039/http://www.history.com/presidents/fdr. Läst 12 januari 2009. ^ ”Harry S Truman (May 8, 1884 – December 26, 1972)”. American Presidents: Life Portrait. C-SPAN. http://americanpresidents.org/presidents/president.asp?PresidentNumber=32. Läst 12 januari 2009. ^ ”Biography of Dwight D. Eisenhower”. Whitehouse.gov. 12 mars 2007. Arkiverad från originalet den 22 januari 2009. https://web.archive.org/web/20090122233750/http://www.whitehouse.gov/about/presidents/dwightdeisenhower/. Läst 12 januari 2009. ^ ”Dwight D. Eisenhower – Democratic Party – 34th President – American Presidents”. History. Arkiverad från originalet den 27 februari 2009. https://web.archive.org/web/20090227201614/http://www.history.com/presidents/eisenhower. Läst 12 januari 2009. ^ ”Dwight D. Eisenhower (October 14, 1890 – March 28, 1969)”. American Presidents: Life Portrait. C-SPAN. http://americanpresidents.org/presidents/president.asp?PresidentNumber=33. Läst 12 januari 2009. ^ ”Biography of John F. Kennedy”. Whitehouse.gov. 12 mars 2007. Arkiverad från originalet den 22 januari 2009. https://web.archive.org/web/20090122233723/http://www.whitehouse.gov/about/presidents/johnfkennedy/. Läst 12 januari 2009. ^ ”John F. Kennedy – Democratic Party – 35th President – American Presidents”. History. Arkiverad från originalet den 26 februari 2009. https://web.archive.org/web/20090226041544/http://www.history.com/presidents/kennedy. Läst 12 januari 2009. ^ ”John F. Kennedy (May 29, 1917 – November 22, 1963)”. American Presidents: Life Portrait. C-SPAN. http://americanpresidents.org/presidents/president.asp?PresidentNumber=34. Läst 12 januari 2009. ^ ”Lyndon B. Johnson – Democratic Party – 36th President – American Presidents”. History. Arkiverad från originalet den 26 februari 2009. https://web.archive.org/web/20090226041544/http://www.history.com/presidents/kennedy. Läst 12 januari 2009. ^ ”Lyndon B. Johnson (August 27, 1908 – January 22, 1973)”. American Presidents: Life Portrait. C-SPAN. http://americanpresidents.org/presidents/president.asp?PresidentNumber=35. Läst 12 januari 2009. ^ ”Richard M. Nixon”. Whitehouse.gov. 12 mars 2007. Arkiverad från originalet den 22 januari 2009. https://web.archive.org/web/20090122233945/http://www.whitehouse.gov/about/presidents/richardnixon/. Läst 12 januari 2009. ^ ”Richard Nixon – Republican Party – 37th President – American Presidents”. History. Arkiverad från originalet den 25 februari 2009. https://web.archive.org/web/20090225070025/http://www.history.com/presidents/nixon. Läst 12 januari 2009. ^ ”Richard M. Nixon (January 9, 1913 – April 22, 1994)”. American Presidents: Life Portrait. C-SPAN. http://americanpresidents.org/presidents/president.asp?PresidentNumber=36. Läst 12 januari 2009. ^ ”Biography of Gerald R. Ford”. Whitehouse.gov. 12 mars 2007. Arkiverad från originalet den 22 januari 2009. https://web.archive.org/web/20090122233716/http://www.whitehouse.gov/about/presidents/geraldford/. Läst 12 januari 2009. ^ ”Gerald Ford – Republican Party – 38th President – American Presidents”. History. Arkiverad från originalet den 5 mars 2009. https://web.archive.org/web/20090305021527/http://www.history.com/presidents/ford. Läst 12 januari 2009. ^ ”Gerald R. Ford (July 14, 1913 – December 26, 2006)”. American Presidents: Life Portrait. C-SPAN. http://americanpresidents.org/presidents/president.asp?PresidentNumber=37. Läst 12 januari 2009. ^ ”Biography of Jimmy Carter”. Whitehouse.gov. 12 mars 2007. Arkiverad från originalet den 22 januari 2009. https://web.archive.org/web/20090122234202/http://www.whitehouse.gov/about/presidents/jimmycarter/. Läst 12 januari 2009. ^ ”Jimmy Carter – Democratic Party – 39th President – American Presidents”. History. Arkiverad från originalet den 5 mars 2009. https://web.archive.org/web/20090305021527/http://www.history.com/presidents/ford. Läst 12 januari 2009. ^ ”Jimmy Carter (October 1, 1924 – )”. American Presidents: Life Portrait. C-SPAN. http://americanpresidents.org/presidents/president.asp?PresidentNumber=38. Läst 12 januari 2009. ^ ”Biography of Ronald Reagan”. Whitehouse.gov. 25 juni 2008. Arkiverad från originalet den 22 januari 2009. https://web.archive.org/web/20090122181836/http://www.whitehouse.gov/about/presidents/ronaldreagan/. Läst 12 januari 2009. 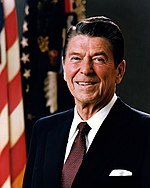 ^ ”Ronald Reagan – Republican Party – 40th President – American Presidents”. History. Arkiverad från originalet den 5 mars 2009. https://web.archive.org/web/20090305021527/http://www.history.com/presidents/ford. Läst 12 januari 2009. ^ ”Ronald Reagan (February 6, 1911 – June 5, 2004)”. American Presidents: Life Portrait. C-SPAN. http://americanpresidents.org/presidents/president.asp?PresidentNumber=39. Läst 12 januari 2009. ^ ”Biography of George Herbert Walker Bush”. Whitehouse.gov. 12 mars 2007. Arkiverad från originalet den 22 januari 2009. https://web.archive.org/web/20090122233824/http://www.whitehouse.gov/about/presidents/georgehwbush/. Läst 12 januari 2009. ^ ”George H. W. Bush – Republican Party – 41st President – American Presidents”. History. Arkiverad från originalet den 5 mars 2009. https://web.archive.org/web/20090305021535/http://www.history.com/presidents/georgebush. Läst 12 januari 2009. ^ ”George Bush (June 12, 1924 – )”. American Presidents: Life Portrait. C-SPAN. http://americanpresidents.org/presidents/president.asp?PresidentNumber=40. Läst 12 januari 2009. ^ ”Biography of William J. Clinton”. Whitehouse.gov. 12 mars 2007. Arkiverad från originalet den 22 januari 2009. https://web.archive.org/web/20090122175555/http://www.whitehouse.gov/about/presidents/williamjclinton/. Läst 12 januari 2009. ^ ”Bill Clinton – Democratic Party – 42nd President – American Presidents”. History. Arkiverad från originalet den 25 februari 2009. https://web.archive.org/web/20090225043344/http://www.history.com/presidents/billclinton. Läst 12 januari 2009. ^ ”Bill Clinton (August 19, 1946 – )”. American Presidents: Life Portrait. C-SPAN. http://americanpresidents.org/presidents/president.asp?PresidentNumber=41. Läst 12 januari 2009. ^ ”Biography of President George W. Bush”. Whitehouse.gov. 25 februari 2007. Arkiverad från originalet den 26 juni 2009. https://web.archive.org/web/20090626223537/http://www.whitehouse.gov/about/presidents/georgewbush/. Läst 12 januari 2009. ^ ”George W. Bush – Republican Party – 43rd President – American Presidents”. History. Arkiverad från originalet den 25 februari 2009. https://web.archive.org/web/20090225043359/http://www.history.com/presidents/georgewbush. Läst 12 januari 2009. ^ ”George W. Bush (July 6, 1946 – )”. American Presidents: Life Portrait. C-SPAN. http://americanpresidents.org/presidents/president.asp?PresidentNumber=42. Läst 12 januari 2009. ^ ”President Barack Obama”. Whitehouse.gov. 20 januari 2009. Arkiverad från originalet den 22 januari 2009. https://web.archive.org/web/20090122102439/http://www.whitehouse.gov/administration/president_obama/. Läst 20 januari 2009. ^ ”Barack Obama – Democratic Party – 44th President – American Presidents”. History. Arkiverad från originalet den 25 februari 2009. https://web.archive.org/web/20090225111259/http://www.history.com/presidents/obama. Läst 12 januari 2009. ^ ”Barack Obama (August 4, 1961 – )”. American Presidents: Life Portrait. C-SPAN. http://americanpresidents.org/presidents/president.asp?PresidentNumber=43. Läst 12 januari 2009. The Presidents of the United States, Vita huset. "POTUS: Presidents of the United States", Internet Public Library. Sidan redigerades senast den 7 april 2019 kl. 16.54.